Here's a trailer for Lucy's Chicago Concert DVD. 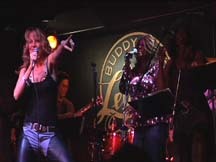 Here's my first videoclip, QT version, of Lucy's Chicago concert at Buddy Guy's. It's a piece of the show opener, "Tell Mama." 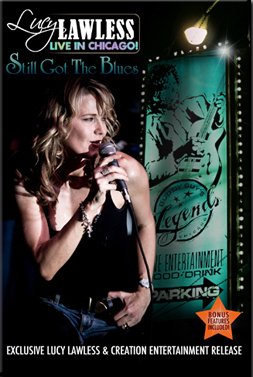 The blues numbers and ballads that Lucy added to the lineup are showcasing her skills as a performer. While there were whispers of excitement during the rock numbers, the silence was total as the audience was enraptured by"Heaven Down Here"which I'll put up later. 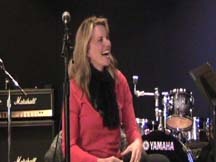 Just added a second rehearsal videoclip to the Lucy Lawless Fan Club of Lucy working out the arrangement to "I Smell A Rat." Interesting song and check out the percussion instrument Lucy gets her hands on at the beginning of the clip. Also, I filmed a bit of Lucy doing the Mancow radio show yesterday and WGN-AM radio this morning. I'll be putting these two clips up on Creation TV after the convention. At WGN, she sang a song that isn't part of the concert. Lucy had her first rehearsal today with Joe LoDuca and her backup singers. I filmed it and here's the first videoclip. I only have it in QT, but I'll put it up on youtube later on as I have to be up at 5am for her first interview tomorrow, er, today! It's "Feeling All Right" and the gang is having a rolicking good time. Lucy introduced me to Tuck and Patti and, before I knew it, I owned all five albums they had released up to that time. Lucy's doing one of my favorites of their songs, "Heaven Down Here." Have a listen below if you've never heard their songs. And you can hear a bit of the Melissa Etheridge song she chose for the Chicago concert over on the Lucy Lawless Fan Club page. Lucy's working hard getting ready for her Chicago concert. It doesn't hurt to throw in a bit of yoga while you're at it as well. Here she dives into "River Deep, Mountain High." 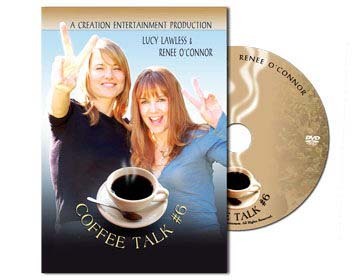 Check out the Lucy Lawless Fan Club page for "Fooled Around and Fell In Love." footage from the Canal Room show.